This 10 session seminar (free) further develops the training introduced here to overcome anxiety. Or purchase your own copy of the Overcoming Anxiety manual in print or digital. The BFF Discipleship Training Library includes reading, powerpoints and worksheets. Check out the BFF Resource Center. Purpose: Can we recognize anxiety? People all around us are worried. What about you? This fourth of eight articles helps us recognize the impact anxiety has on our lives. 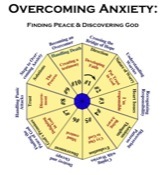 Possessing God's Precious Peace: Overcoming Anxiety is the fifth lesson in the Discipleship Level 2: Reaching Beyond Mediocrity. Anxiety is typically first felt in the area of one's emotions. A person can't focus and feels overwhelmed. Things are beyond one's control. 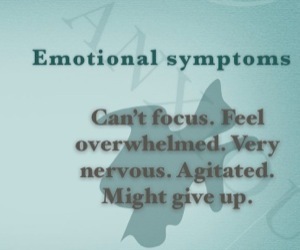 The person often becomes agitated, critical and sometimes just feels like giving up. 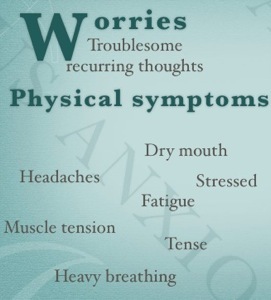 ￼Each of these interrelate with each other and because of the attention of the worry, physical symptoms also occur. Headaches, muscle tension, tired, heavy breathing, stressed out, tense, dry mouth and many other physical symptoms can also take place. Worry first takes place in our spirit, then grabs hold of our emotions. Because of the strain on our bodies, our bodies begin to show their wear and tear on our physical bodies by the constant focus on our worry. A person's spiritual symptoms are not easily observed because spiritual things are invisible by definition. Because a person's mind keeps drifting to their job or health condition, he cannot focus on what he is suppose to including God's Word. He just keeps thinking about these other matters. Did you ever sit down to read God's Word or pray but your mind keeps drifting toward something that are a bit anxious about? These anxieties steal our love for God. Or perhaps we should more exactly state, that our anxieties reveal that we have trusted things other than God. Anxieties have a way of getting down deep in a person. When anxiety continues to affect a person, then it begins to interfere with their daily routine. Things that seem easy to do become impossible. I remember some big struggles about packing for a vacation. My wife normally would care for that but somehow she would not pack until the last minute and then perhaps she would be unwilling to pack at all (written with permission). All our kids are in bed sleeping and dreaming about where we will go the next day, but it looks like we are not going anywhere! What happened in this case was that she was overwhelmed (think worry) with all the packing. The problem is not whether she could pack. She always showed. She did in the end but only in a most distressed state. She discovered she worried about packing. Now she looks forward to vacation. Worries can hit us in every area of our lives. If we allow them, they will invade our whole being. They will continue on to destroy our normal lives until we at some point hold back its invasion. The world's attempts to hold back this attack are quite inadequate. One cannot blame the world for strongly believing that anxiety is normal. This can be a sensitive area to some, but if we have a historical perspective of worry things really make sense.